The Punjab Verka Milkfed has announced huge number of vacancies for you. The Punjab Verka Milkfed has announced 43 vacancies for senior executive posts. Candidates who are eligible and interested for these posts. They can apply for Punjab Verka Milkfed Recruitment 2018 from website www.verka.coop. Official notification is already uploaded on website. Candidates can read official notification. before applying for these posts. Online application form will start from 21st November 2018. Last date to fill application form is 14th December 2018. Further details like important dates,eligibility criteria. application fee, selection process, age limit, pay scale, how to apply etc. is given below. 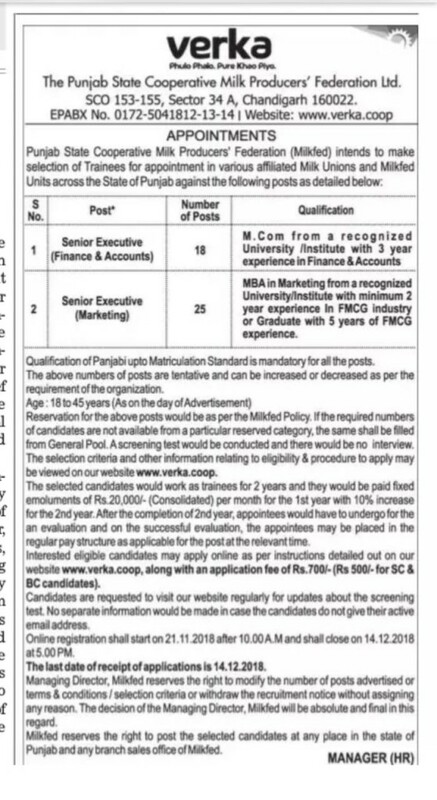 As you know, The Punjab Verka Milkfed has announced recruitment notice to fill various vacancies of senior executive Posts. Eligible and interested candidates for these vacancies can apply through official website. Further, candidates can check details from below. Educational Qualification :- Candidates who are going to apply for this Punjab Verka Milkfed senior executive 2018 Application Form, they must have possess following qualifications. Senior executive (finance & accounts): M.Com from recognized university with 3 years experience of finance and accounts. Senior executive (marketing): MBA from recognized university with 2 years experience in FMCG industry or 5 years experience after graduation. Candidate must have studied Punjabi up to 10th standard. Age Limit :- 18-45 years as per official notification. Pay Scale:- Basic Rs.20,000/- during trainee period. Application fee: Candidates will have to pay application fee of Rs.700/- for General and Rs.500/- for BC/SC. How to apply for Punjab Verka Milkfed Recruitment 2018 ? Interested and eligible candidates may apply through official website www.verka.coop from 21st November 2018 to 14th December 2018. Sir link is not available in official site for downloading application. Please suggest sir ,now what should we do . Procurement assistant da jo technical subject aa….os de study notes send krdo if Anyone have?? ???? sir biotech student eligible for milk precurement vacany ?? I am completed my secondary education in 2016 in non-medical and i like to do wotk in punjab verk milk dairy? ?